The Siamese Cat... Intelligent and Devoted, There Are No Finer Cat! The Siamese cat breed is perfect for those who want a playful, talkative, and interactive cat. For the right person, these cats make devoted pets. Even people who do not like cats are familiar with the Siamese cat breed. The bold and playful nature of this cat breed makes their presence known, even to those who don't care to know. These crazy cats are characters in several popular mystery series, and they have been featured in movies and television shows for years. The curious side of this cat breed's personality makes them great companions, and stars in their own homes. Yes, the Siamese cat is the movie star of the cat world. The Siamese is an ancient breed, which may account for their devoted people loving nature. They first appeared sometime before the sixteen hundreds in the country then known as Siam, now Thailand. In the eighteen hundreds, several of these beautiful, graceful cats were brought to Great Britain by the British ambassador when he returned home. With its distinctive looks, intelligence, and devious charm, this breed was immediately popular with cat fanciers. By the nineteen fifties, the Siamese was one of the most popular cat breeds in the world. The Siamese cat has a long, graceful body with a rectangular shape to it. They have a wedge shaped head, large ears, a long, graceful tail, and long, thin legs. This breed's eyes are large and almond shaped, with a striking blue color. They often appear cross eyed. These cats have a short coat that comes in Seal Point, Chocolate Point, Blue Point, or Lilac Point colors. Any other color variations of the Siamese breed are considered to be a completely different breed, the Colorpoint Shorthair. The Colorpoint allows for tabby cats (lynx point) in this breed. Make no mistake, Siamese cats are smart. In addition, the Siamese is a very playful and affectionate breed. Because of this, these cats are not generally a good choice for people who spend a lot of time away from home. A lonely and bored Siamese can get into more trouble than the average cat. In fact, she probably will spend much of the time plotting an escape! Do you remember Si and Am, the two singing Siamese cats from the Disney movie, Lady and the Tramp? They were modeled after the "dark side" of the Siamese. They were quite the devious troublemakers! If you do decide to adopt one of these cats, you probably will want two. A second kitten in the house will keep your cat from being lonely while you are out of the house. Since they enjoy spending time with people, both cats will still spend a lot of quality time with you when you are home. 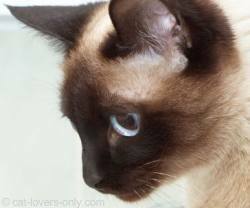 Being very outgoing, the Siamese is a good choice for families or retired people. This breed soaks up attention like a sponge. Your cat will follow you and other family members throughout the house, inspecting your work and trying to help complete chores. They are excellent assistants, and even better supervisors! When you take a break or watch tv, she will be right there with you. While more active than a true lap cat, your Siamese cat will probably curl up on your lap or perch on your shoulder. A fishing type cat toy is a great idea while you and your cat are one the couch together. You can watch TV and be close to your cat, and your cat can play. One word of caution: If you think that a clingy cat will be annoying, this breed may actually be too devoted for you to handle. The Siamese breed, being highly intelligent, is also highly trainable. On the other hand, they are also quite independent and quite fearless. After all, they are cats! They know their own minds, so they may not always perform for you on command. This can be embarrassing when the neighbors are waiting to see a trick! You can, however, easily teach your cat to fetch or come when she is called. We all know that cats own their people, but some Siamese take this to an extreme. OK, so the owners are probably to blame (aren't the humans always at fault?). They also tend to be extremely talkative and this can drive some people a bit crazy. In the below video, h̶e̶r̶e̶'s̶ ̶a̶ ̶b̶e̶a̶u̶t̶i̶f̶u̶l̶ ̶S̶i̶a̶m̶e̶s̶e̶ ̶n̶a̶m̶e̶d̶ ̶A̶l̶a̶s̶k̶a̶ ̶w̶h̶o̶ ̶i̶s̶ ̶b̶o̶t̶h̶ ̶v̶e̶r̶y̶ ̶t̶a̶l̶k̶a̶t̶i̶v̶e̶, ̶a̶n̶d̶ ̶o̶b̶v̶i̶o̶u̶s̶l̶y̶ ̶o̶w̶n̶s̶ ̶h̶e̶r̶ ̶p̶e̶r̶s̶o̶n̶ ̶t̶o̶ ̶t̶h̶e̶ ̶m̶a̶x̶. ̶T̶a̶l̶k̶ ̶a̶b̶o̶u̶t̶ ̶p̶a̶s̶s̶i̶v̶e̶ ̶a̶g̶g̶r̶e̶s̶s̶i̶v̶e̶ ̶b̶e̶h̶a̶v̶i̶o̶r̶!̶ Unfortunately, that video is now private, so instead, here are two Siamese kitties singing for their supper! See more video of Siamese cousins chatting it up here. Learn more about the behavior of these fascinating cats here. Your "finer cat from Siam" will also make up her own games, such as hide and seek. Ambushing unsuspecting family members and guests is another favorite of Siamese cats. These cats have been known to wait patiently on top of refrigerators, shelves, or other high locations and then pounce on people passing by. I personally would love the opportunity to interact with a cat like that, but you might feel otherwise! If you would like to own a very vocal, intelligent, attention loving cat, then the Siamese may be the ideal breed for you. If you're interested in the Siamese cat, then in addition to the Colorpoint shorthair, you might also want to check out some longhaired cousins of this crazy feline. Specifically, I'm talking about the Balinese and the Javanese.